Fence Tests: Which Security Fence Is Best For Your Home? 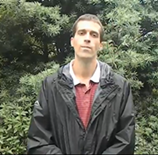 Find out which barrier will best protect your home from burglars with my “Fence Tests” videos. Discover the truth about home security in an easy, visual way. By actually climbing over people’s perimeter fences, walls and gates myself, I discover, without a doubt, which ones are good and which ones are USELESS! Go straight to the videos! 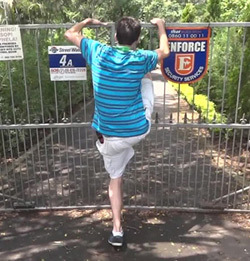 Me climbing a gate to test its security! I have often thought to myself how easy it would be to climb over them (and so, naturally, it would be even easier for a burglar or criminal to do so, since they would have more experience). That constant thought gave rise to the idea for this section of the site. I go around to people's houses and tell them who I am and what I am doing. Then I ask them if I can film myself climbing over their fence or wall! You, the reader of the Escape Crime website, gain a much clearer understanding of which kinds of security fences or walls are the most difficult to defeat. If you haven't yet chosen a fence or wall to buy, this will help you to make the right decision. Have a look at the home security test videos below. You can read my intro for each one as well as whether it was a Success or Failure. Note: I always receive permission from the owner of the property before I climb over their perimeter barriers for these videos. If you have any comments or questions, feel free to let me know via my Contact page or leave me a comment on my Facebook page. This is the first actual "Test" video of the series. The only thing is, I'm not climbing over a fence, but rather a gate! This gate is a metal automatic opening gate with sharp spikes along the middle section, but none on the top of the gate. Climbing over this one was quite scary! The sharp metal spikes were intimidating at first. As it turns out, though, they were not really a problem. This kind of fencing is generally thought of as quite "high security". Many homes and businesses trust this sort of fence to protect their properties. I found that despite the confidence that many people have in it, it was not difficult to climb over at all. This one is a normal wire fence that is commonly used to surround many homes. It's cheaper to install than most other kinds of fences. This makes it a very attractive home security option. As you can see from this fence test video, it doesn't provide a major barrier (as long as the criminal takes off his shoes first!). The other negative of this kind of fence is that a burglar could cut a hole in it with wire cutters and simply climb through. Since the "security" offered by many of these fences seems to be so easy to defeat, what should you do? Any fence is better than nothing - The first step for you, as a homeowner, should be to make sure you HAVE a barrier of some kind around your home. Any kind of fence will make the criminal's job more difficult. Palisade Fencing - Some, like the green palisade fence (Test #2), where quite intimidating, despite my eventual success. Those spikes are SCARY! That thing is HIGH! I would recommend installing this kind of fence above most other regular fences (such as those made from wire mesh, wood or concrete). Barbs and spikes - Barbs, spikes and other sharp, metal protrusions on top of these perimeter barriers were a BIG deterrent to me. However, the way the spikes are designed is very important. Spikes that are spaced wide apart (such as the palisade ones in test #2) are very easy to avoid. Sharp spikes that are much closer together (with less than a human foot width or about 10cm / 3.5 in between them) are hard to avoid and if they are sharp enough, could poke through the sole of a criminal's shoe (This actually happened to me in my first video! Take a look). Barbed wire - Walls and fences with barbed or razor wire on top were also VERY hard to tackle. While I haven't been filmed trying to climb over any of these, I HAVE closely inspected a few of them. I struggled to find a safe way to clamber over them. The only strategy I could think of, was to use a thick piece of carpet or rubber to lay over the top of the barbed wire to protect my hands as I hopped over. The higher the barbed wire section on top of the wall, the harder it looked to get over. I was not even willing to TRY to do a fence test on any ELECTRIC fences. I thought about it a lot, but could not come up with a way to do it without getting shocked. Now, I may be misinformed about the real power of household electric fences (in other words, they may only give a weak shock), but I wasn't willing to take the risk! Please let me know if you have any comments or questions about these videos by leaving me a message on my Contact page or my Facebook page. Home Security Video Cameras - Keep an eye on your property at all times.